So, I'm starting this thread mostly for selfish reasons. I love ogling the N4s made by Stephen Davies. But, I'm sure there are many others visiting this board that would like to see a handful of the beautiful creations by Mr. Davies and understand how to quickly identify a true Davies model at a quick glance. So, if you have one, snap a photo and share it with your pals! 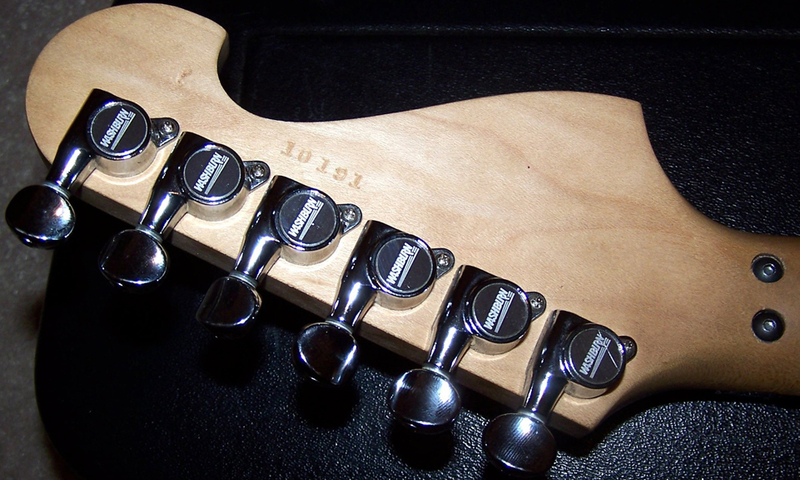 Front, back, and headstock revealing serial number would be a good start. If you want to show more, great! Let's see 'em, guys (and girls)! As you can see, the trem cavity on Davies N4s has an inverted T shape. As you can see, the relic is a special case, but the volume and trem cavities have different shapes, so it's easy to spot. I was considering posting some detailed photos much like you have above. Now, I don't have to [ ] ! Thanks a bunch for saving me time. lol Great photos, btw. 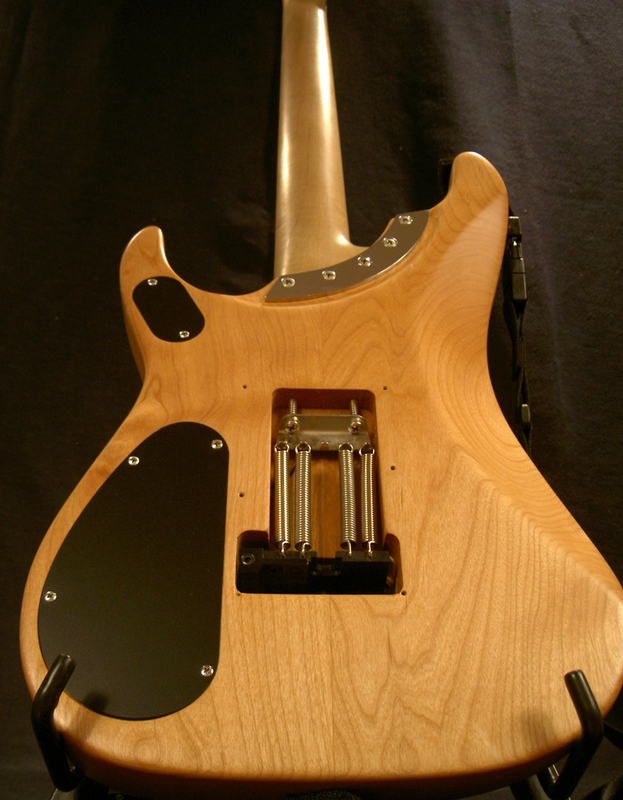 Another detail to note, the tummy contour on a Davies is a little wider than production N4s. The contour comes much closer to the SEC 5-bolt plate on the back....just look at the pics above. By the way, it's a Bill&Becky on yours too, am I right ? Which one ? L or XL ? Yes, I picked up 3 BL500l a couple of years ago. I don't have to tell you what a difference they made. I love em : ) I like the balance of the BL500l with the '59. I figured the XL might overpower the '59 when both pups were on. Here's another difference with the Davies, me and my friend were just talking about the other day... the one on the left is a Davies which belongs to my friend and the one on the right is my '91 transitional Davies with a Grover/Jackson body. Notice the Davies on the left has a thinner, more contoured body, which you can really see on the bottom left side. That's the main reason they are a little more light weight... a little less wood. Does anyone know the number of N4s Davies made ? Some believe it's around 1200. I'm not sure how many, but I do know Davies made about 200 transitional's from late '91 to Feb '92. Grover Jackson was producing raw necks and bodies but were unable to finish and assemble them, sent them to Davies for machining, finishing, fret work and all the rest. Davies wrote that to my friend directly when inquiring about my 91. I'm guessing he probably made about 50 to 100 a month for a good year, so that number is probably fairly accurate. How would you fill the selector hole anyway ? I do believe the N3 was a Davies. I could be wrong but I doubt it. I'm merely going to mimic Nuno's N3 which made a brief appeance in one the Extreme music video's. In case you didn't know the N3 has two BL's in it. According to my good friend Skee, it's an L500R in the Neck. I didn't realize there wasn't a selector switch. I think I'll keep mine. I like variety. Another deviation from the glorius N. When I replace all my BL USA pickups, I'll be putting in push/pull pots too. I just happen to have 3 of them, and I'll be switching out 3 so it works out. Just found a picture of it in a post right here on this very board. Though in the video his N3 actually had the space tape N3 sticker on it. And I see the selector by the knob. I don't like that so I'll just leave it where it is. Ah, I see now. The N3 was only produced by Washburn. If Davies had anything to do with an N3, which I'm sure he did being the cutaway is on it, it would've only been Nuno's. I know Nuno pretty much built his own guitars early on before Washburn got a hold of him. He would take the body, which I believe were Jackson or Charvel into a local music shop to have it shaved down to size, would rip the guitar up and replace whatever he felt needed replacing. Washburn took what Nuno had done himself, made a deal with Nuno and took off with that design and then started making Nuno's guitars. It took a long time for Washburn to get 'em the way Nuno wanted and then finally... the production N's were born with Davies making us the first batch of N4's while Korea made the N2's and then the N1 and N3 followed later as other options. Nuno's N1, N2, and N3 were just improvements upon each other until the holy grail N4 satisfied him. Washburn producing the N1- 2 & 3 is just good business for them and good options for people who can't afford the N4 but want a guitar like Nuno's.